The forces driving density decline—rising per capita incomes, cheap agricultural lands, efficient transport, and income inequality—are quite formidable. Accordingly, absent a highly effective policy intervention or a steep increase in travel costs in the future, there is little reason for the global decline in densities to slow down anytime soon. I like living in cities (if New York were less expensive—as it was until the ’90s—I’d happily live here forever) and attack legal rules that prohibit higher buildings. But the research Angel has both conducted and cited indicates that, even in the absence of such rules, cities would still probably be getting less dense, or at most evening out. That is news to me; he also says, “No matter how we choose to act, however, we should remain aware that conscious and conscientious efforts to increase the density of our cities require the reversal of a powerful and sustained global tendency for urban densities to decline.” Newer cities, like Phoenix or Dallas, are even less dense than older cities, which is an innovation problem for the reasons described in Steven Berlin Johnson’s Where Good Ideas Come From and Edward Glaeser’s The Triumph of the City. Cities like New York and Boston remain so important because creating dense neighborhoods like those found in both areas is effectively impossible in today’s climate of urban land-use controls. Building such areas doesn’t have to be impossible, but we, collectively, make it so. Take Seattle, a city I’m very familiar with. In downtown Seattle, rents have effectively increased by 40 – 50% from 2002 – 2012, even though some construction has been permitted. Rapid increase indicates that much more could be commercially built, and that many people want to live there and will pay to do so. The chief aim of the UGB was to contain urban sprawl and preserve the natural beauty of the surrounding countryside within reach of city residents. Sprawl was not defined precisely, but presumably it included both low-density development and fragmentation. After examining the change in built-up area density within the UGB between 1973 and 2005, we found that densities decreased rather than increased. The possibility that cities worldwide are now in a process of transformation from a monocentric to a polycentric spatial structure poses an interesting challenge. It suggests that if public transport is to be a viable option in areas of expansion to economize on the energy expended and to limit greenhouse gas emissions, then it cannot be limited to continued reliance on radial routes to the city center. The transport network must be two-dimensional, providing frequent and reliable service among suburban destinations over the entire metropolitan area, rather than a one-dimensional network of radial routes into the city center. Some public transport systems that already provide such service are the bus lines of Edmonton and Toronto in Canada. To provide reliable point-to-point service throughout metropolitan areas and to function effectively, bus lines or new transportation technologies will need to operate on a grid of arterial roads. Again, this is certainly true in Seattle: I can’t find a citation, but for a time there was more Class-A office space in downtown Bellevue than downtown Seattle. In the greater Seattle area, there are major population and employment centers in Seattle itself, Bellevue, downtown Kirkland, Redmond (where Microsoft is headquartered) and Renton (where Boeing has or had many facilities). Many people I went to high school with live on the Eastside and seldom cross Lake Washington, and they can live a relatively urban experience in downtown Bellevue or Kirkland. Seattle as a city still imposes severe height limits in areas adjacent to downtown, and, as a result, some of the development and population infill that might otherwise take place, say, east of 12th Avenue or North of Olive / John on Capitol Hill, instead moves to Kirkland and Bellevue. The style in Planet of Cities is unimpressive, verging on non-existent, as the quotes above demonstrate. But its insights impress, as does its re-evaluation of the conventional wisdom about rising densities in cities. As I wrote in the first paragraph, it’s a specialist book for specialist interests. Still, most people hold naive views on city planning, even if they don’t realize they hold such views. 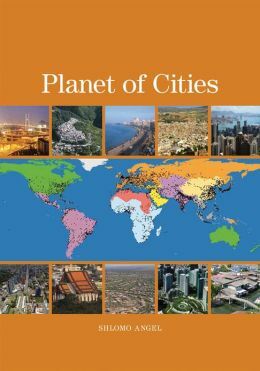 Planet of Cities replaces naiveté with knowledge. It could use panache, but that’s true of almost all textbooks and monographs. EDIT: Anthony Flint of the Lincoln Institute of Land Policy wrote to ask me to note that the Lincoln Institute of Land Policy published this book. I’m not sure why this is important, but here it is. Does the book address climate change in any meaningful way? I.e., that to have a realistic chance of meeting 2 or 2.5 degrees targets, that CO2 emissions per annum needs to decline 80-90% in the US? Can mobility targets be achieved if you assume that the city needs to work with 80-90% less CO2 emissions? I live close to downtown in Houston, rely on mass transit and find staggering the number of cars which clog the street nearby me. These cars of course come from the outskirts of Houston; not only do these cars from the suburbs increase global warming, they increase the smog level for people who actually have to live inside the city. I’ve seen studies that living within 500 meters of a freeway or a major road increase your chances of autism and asthma and possibly cancer– I live within 500 meters of BOTH a freeway and a major road. I suffer the consequences, and yet the drivers from the suburbs in their air-conditioned cars don’t pay a price (except at the gas tank). A lot of urban planners just are ignorant of climate change’s effects or gleefully assume that eventually the public sector will catch up and eventually build some mass transit. (Houston just introduced 8 miles of light rail after 30 years of lobbying). Urban sprawl becomes an excuse to keep the car culture and oil dependency. The quote you gave suggested BUS lines as ways to connect different regions in a city with one another. The one thing they don’t suggest is what powers these buses. NYC has begun to deploy electric buses, but in my city the overwhelming majority of buses are diesel. In Houston they don’t even use the allegedly-clean-but-not-really-clean buses powered by natural gas. I don’t know a lot about urban planning, but I assume Portland is a good counterexample. But again, most buses (even in Portland) use diesel engines.